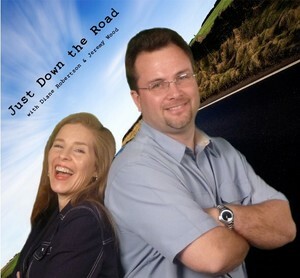 Diane Robertson and Jeremy Wood host "Just Down the Road"
I recently interviewed Jeremy Wood and Barry Douglas about their new travel show debuting July 1st to millions of viewers across the nation. “Down the Road” produced and directed by Lee’s Summit-based Cinematic Visions is the classic unbudgeted unexpected idea that’s yielding the unforecasted harvest. Jeremy got the idea for the show while he was on the set of the Steve & Kathy Show, another locally-produced Emmy-award winning show. The show is unscripted and offers a behind the scenes tours of off-the-main-road attractions across the Midwest. The idea has paid off with a deal for the show to broadcast into 123 million homes on Resort & Residence TV and the River Broadcasting Network. I love this project because it perfectly illustrates how ideas that are off the radar can payoff big. Don’t be afraid of those creative ideas that seem to come out of nowhere. What would you do or where would you be if you followed through that “aha” moment you got while driving to work this morning? Write that idea down and dream again. You never know how far it will go. Check out Jeremy’s dream come true on http://www.justdowntheroad.net. Thee muse strikes again. Great idea cant wait to see. Nothing like finding hidden gems.